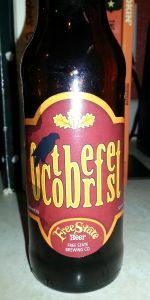 Home Beers Free State Brewing Co.
Octoberfest | Free State Brewing Co. This is a smooth, malty lager fashioned after the famous Octoberfest beers in Munich. Each year around this time, the Germans celebrate the anniversary of the marriage, in 1810, of the Crown Prince of Bavaria. Huge crowds pile into Munich to imbibe the pride of the cities breweries by the stein full. Free State's Octoberfest is made from Pilsen malt, caramunich malt, lots of Munich malt, caramel pils malt and aromatic malt. These combine to provide a light amber beer with a smooth, clean malt character that comes through clearly. The hops are Perle for bittering and Hersbrucker for a mild aroma. 12oz bottle bb 1/9/19 poured into a krug at fridge temp, no ABV listed on label. The beer pours bright orange tinted copper with light khaki head. The head recedes to a few bubbles and a pencil thin ring. The aroma is caramel malt and a little yeast. The taste is big Munich malt up front, a little sweet, but also bready with a slightly metallic firm hop bitterness on the end. Mouthfeel is thin to medium bodied, adequately carbonated and mostly dry in the finish. Overall, very good. A Marzen this sweet using caramel malt would be poor, but the Munich malt has a nice taste. Could be a touch drier, but worth drinking overall. Wonderful amber gold color with a tall white head. The aroma has a clean maltiness and a few grin notes. Medium in body, balanced, with plenty of complex malt notes. Full in body, and the hops come out in the finish. Not bad at all. Very drinkable. Deep copper color--nearly brown. Clear. Excellent starting head which leaves some initial spotting on the glass. Strong, sweet caramel nose. All malt. Round, fully toasted, but not burnt, malt with lots of residual sugars. I don't get any hop whatsoever. The finish reminds me of toffee with dark toasted bread. The body is thinner than I expected but appropriate for the style. Neutral carbonation. Short aftertaste. Enjoyed on tap at the St. Andrews golf course in Overland Park, kansas. Pours a clear dark amber. Slight white head. Subtle malt aroma. Lots of malt, reminds me of a rustic dark wheat bread. A little bit of hops. Very rich. Full mouthfeel. T: the malts and grain give it a hint of sweetness with a nice roast. Earthy hops on the end with lingering roasted malt flavor. F: Rich alittle heavy for the style. Carbonation is average but alittle harsh like colas. O: First off I like a malt based beer this is my type of marzen. It is a little malt heavy, it has some carbonation bite. If you want a marzen a little rough around the edges due to roasted malt give it a go. It is not the most balanced but it works and I love the roasted earthy rustic taste. Light burnt orange color, 2 fingers of fluffy, semi-stable head, gradually receding to a half finger. 20% opaque. Aromas of yeast, dough, amber malts, nutmeg, and toffee. Difficult nose. Flavors of some fall corn, spice and malts, namely nutmeg and cinnamon, with barley and oats; some leafy, hoppy qualities, and rough pumpkin rind. Feel is quenching and wet, with apt carbonation and a semi dry finish. Definitely "okay". Like Sam Adams' Octoberfest if Sam Adams did it correctly. I was expecting better from the reviews, but this is just another simple fall lager that does the trick on a less than par level. Octoberfest from Free State Brewing Co.